LaRay’s Tacos Plus, a well-known mobile Mexican restaurant, is for sale on the Big Island. Operating lunch service weekdays near downtown Hilo, the successful company has developed a loyal following. 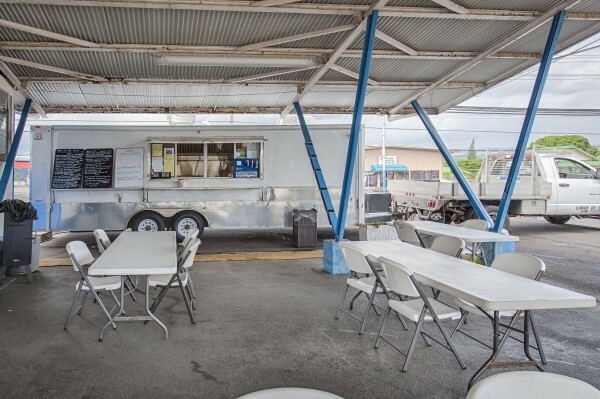 Hilo is the second largest city in the state of Hawaii and the food truck is in a highly visible area with ample free parking close to state, county, and federal government offices. 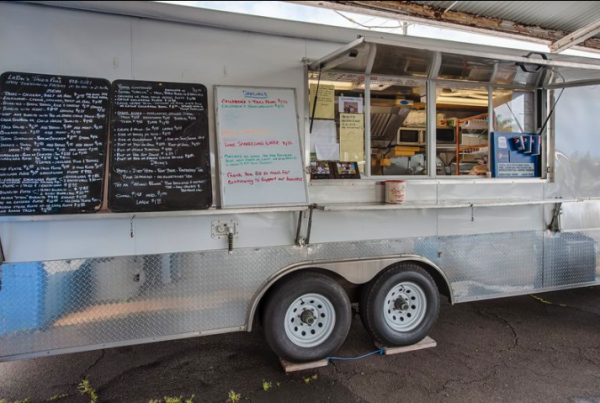 A Mexican food truck for sale in Hilo has built a loyal customer base over the years. The food truck business incudes a 28-foot certified kitchen trailer, a Dodge 1-ton flatbed truck to haul the trailer, all the necessary equipment and supplies to run the business, as well as all recipes. The current owners, Laraine and Ray Agren, are willing to provide two weeks training to a new buyer. The couple is selling because they are relocating to the mainland to be closer to family. This isn’t your usual lunch wagon. Rather, it’s a permitted commissary kitchen that can be moved on site for catering events or movie sets. A steady customer base was developed through word of mouth and the business continues to expand. Potential franchise opportunities also exist for the business. The food truck’s current location includes covered seating and a place to store tables and chairs, which are included in the business sales price. Business flags, banners, cash register, as well as electrical and plumbing hook-ups are also included in the sale. 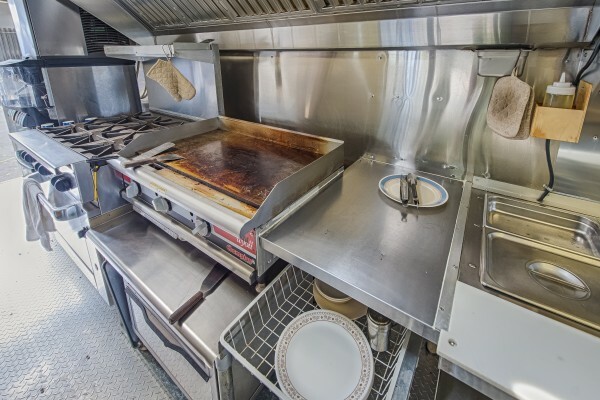 Professional chefs will appreciate the attention to detail within the food truck. Expertly retrofitted in Florida by Paul Gallo and Sons, the food truck was built to meet the requirements of the Hawaii State Department of Health. In addition to top-notch cooking equipment (see the features list), the kitchen contains a 20.6 cubic-foot upright freezer, which has greatly enhanced the business’ profitability. Another plus is the Manitowoc SV Series beverage dispenser with 8 beverage valves and ice dispenser with on-board plumbing. The system provides for profitable soda operations and ensures the food truck never runs out of ice. Spacious storage and refrigeration within the food trailer provides plenty of room for food storage and preparation. Such unique features enable the owner to save money since they don’t have to rent a commissary kitchen. 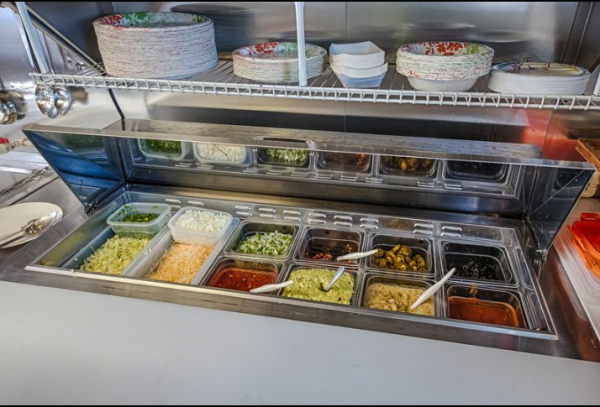 It also means that the Mexican food truck can provide food longer than other food trucks – continuing to serve customers when other food trucks run out of food. A comfortable working environment is an important element of the food truck’s design. Organizational items, such as custom towel bars, wall mounted soap and paper towel dispensers, hanging racks, utensil racks, storage drawers, and other assorted items make cooking easy and allow for quick cleanup. Offered at $125,000 turn-key. For information on this exciting opportunity and other properties, give me a call today at (808) 963-6880 or email Beverly@beverlymolfino.com.